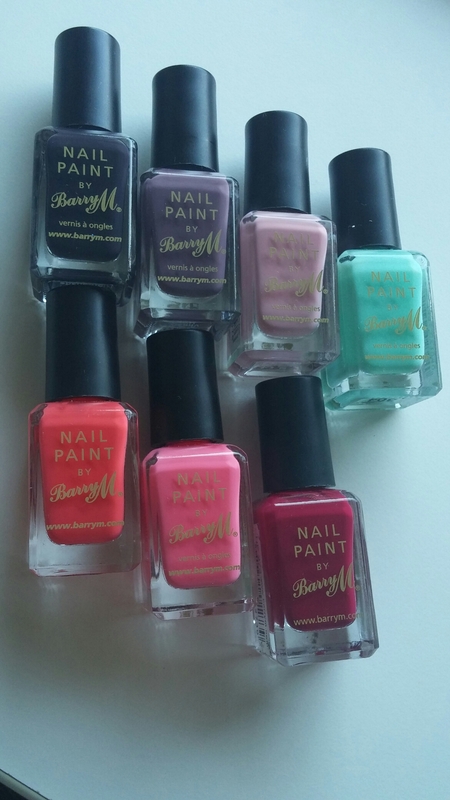 Followers of my blog and of my Instagram account will know that I have a bit of an obsession with BarryM nail polishes. I don’t quite own all of them yet, but that’s not for lack of trying! They seem to be bringing out more and more collections these days and I struggle to keep up, in terms of the amount of space I actually have to keep them, and the cost of them (even though individually they cost around £3-4 per nail polish) – when A collection comes out with 5 or more shades the cost piles up! Anyway, I’ve created a pin board with my manis and flatlays in once place in case you are a total Nail Polish nut like me! Go ahead and give it a follow! 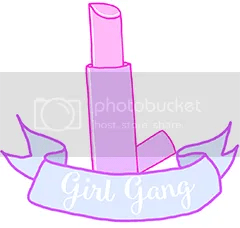 I’d love to connect with more of you on Pinterest too, so leave me your links in the comments below and I’ll check out your boards! 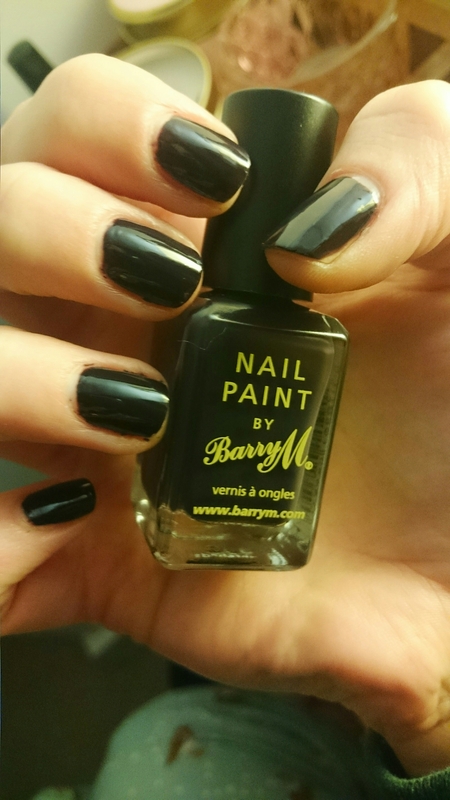 You probably already know by now, but I am a fully fledged nail polish freak, and a Barry M addict in particular. In my view there is no better value polish on the market for quality you get. 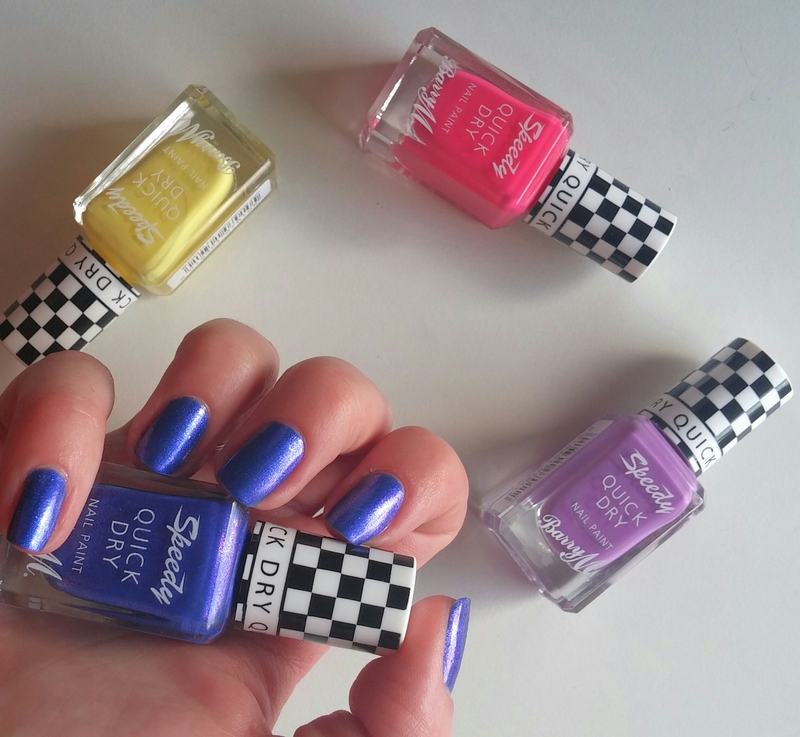 The speedy quick dry collection really appealed to me as there’s nothing I hate more than smudging my nails! I’m always on the go and so the faster it dried the better. 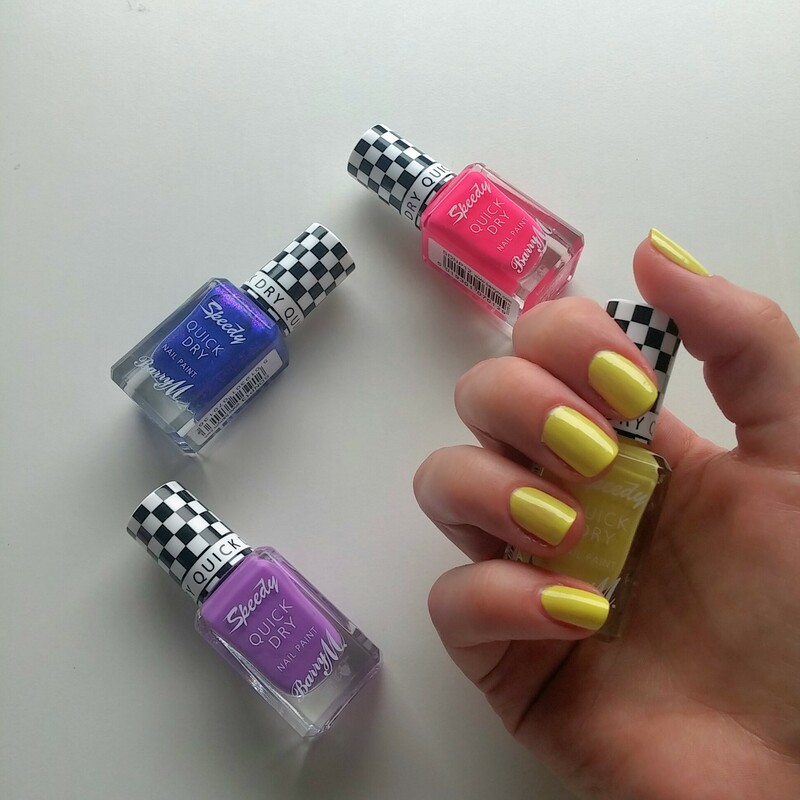 These polishes really do deliver on their quick dry polish. I thought I would swatch the “brights” of the collection (as they have pastels too!) that I own. They’re always bringing out more shades and my collection grows! If you’re interested I can do a post showing the swatches of my pastels quick dry collection? 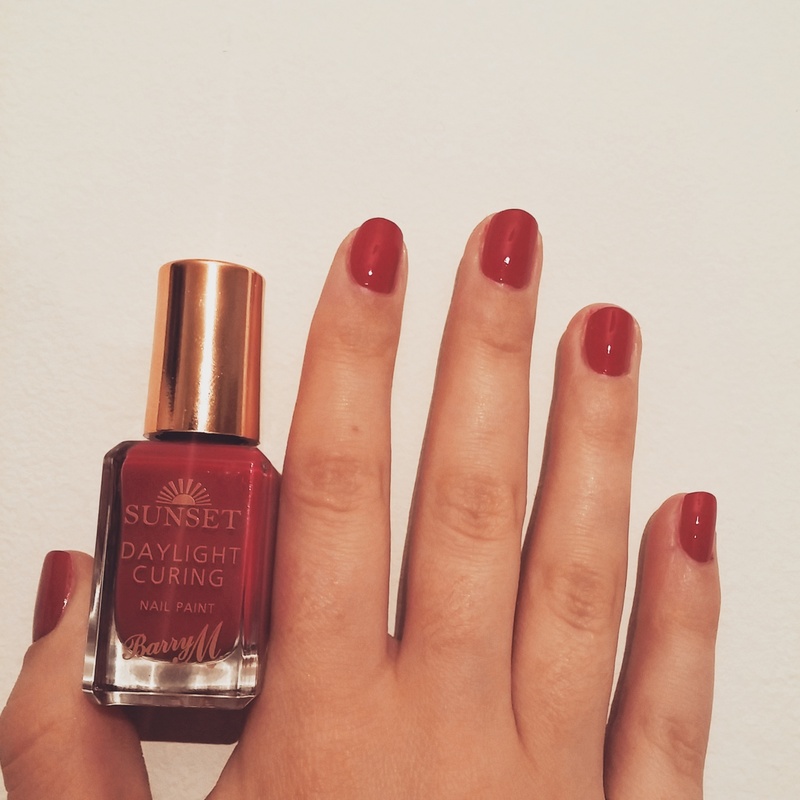 You might remember that I blogged about my YSL polish; how I absolutely loved the colour but not the fact that it chopped somewhay too easily for a polish that cost £18.00. I have a number of blues in my collection, after having picked up a few more in order to try and find a cheaper replacement to console me! Far left is YSL, the rest are Barry M on swatch wheel featuring blue grape, supersonic, Malibu, blackberry and blueberry. From the left most swatch on the dial it’s YSL on bleu majorelle, followed by BarryM polishes in ; Supersonic, special edition in bikini, on my nails is blue grape, followed by malibu (matte) , blackberry and finally blueberry! Blue grape is gorgeous, closely followed by Supersonic as pictured below. 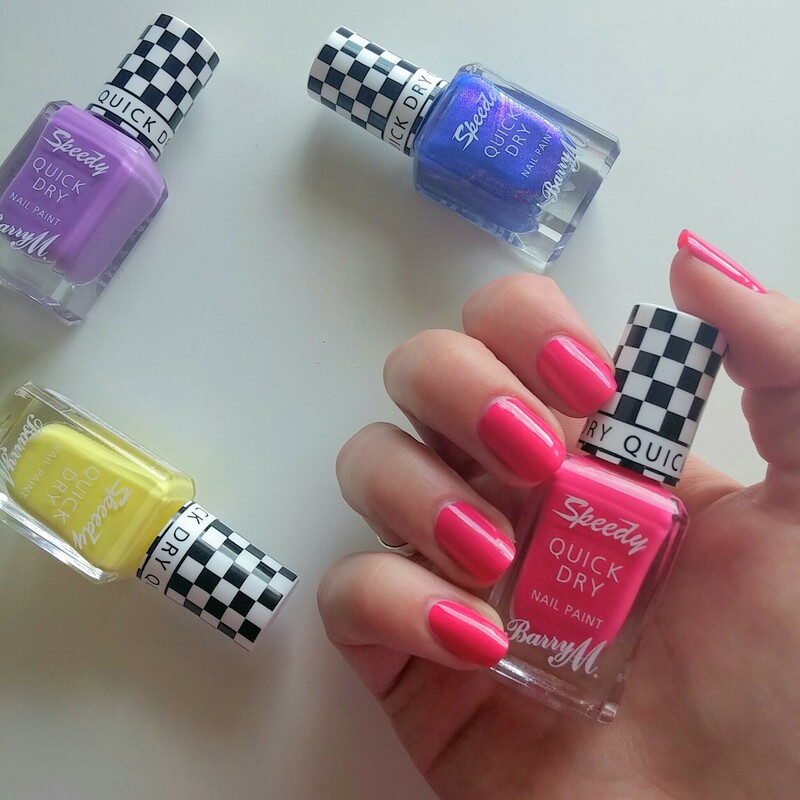 The speedy quick dry polishes have the best formula though, I can’t fault it! 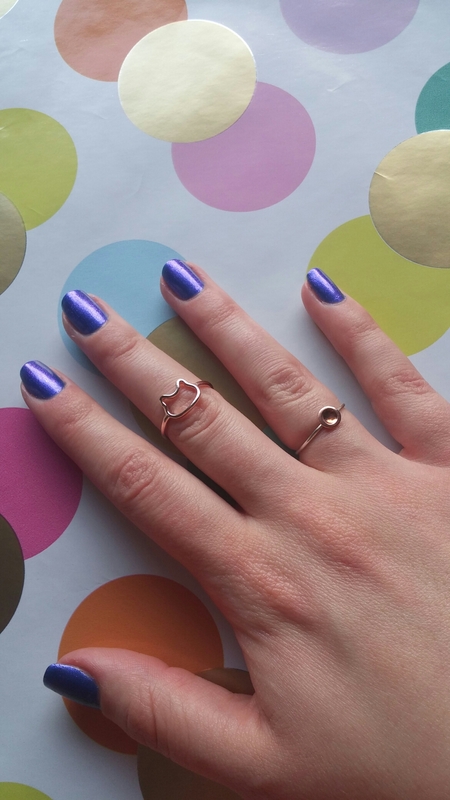 Rings are from Poppy Kitten Designs and LouiseMacJewels! I absolutely had to try this out. I’m a girl who is forever rolling up her sleeves and getting stuck in, so my nails always pay the price for it! 10 days of colour they promise. 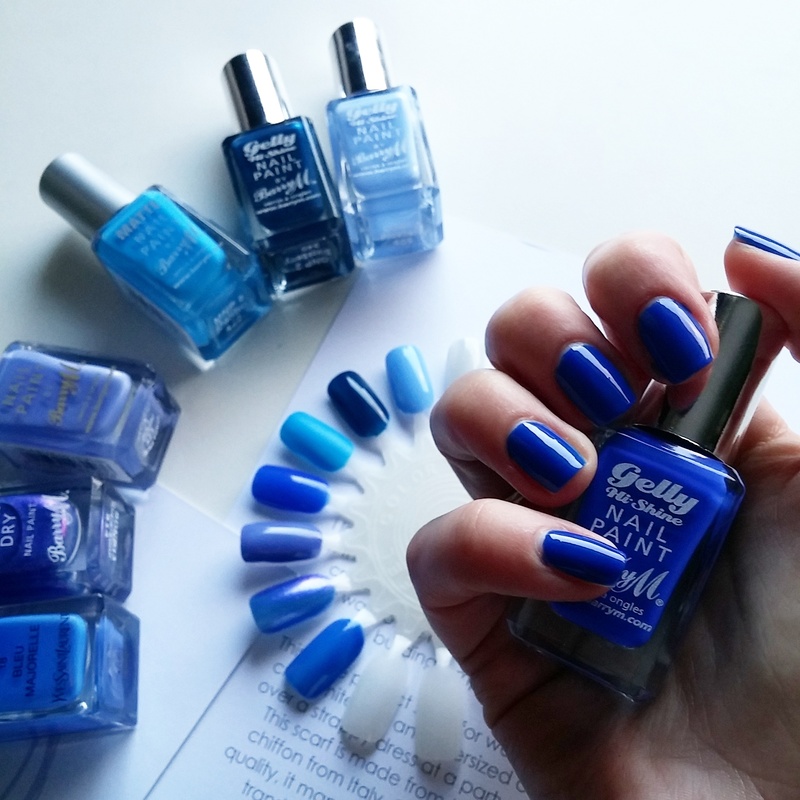 I had to choose 1 colour because I’d already spent a bucket load on the speedy dry polishes. I settled for the classic ‘Fushia Generation’, a deep rich pink which appears darker, more towards plum in the bottle and in certain blue-eyed lighting. I was instantly impressed with the application of this Polish. I applied 2 coats for full coverage with 1 coat of the daylight curing Polish. I painted my nails at night so I supplemented the drying process a bit with my UV lamp. It dried super quick and the end result is beautiful. These are available for £4.99 each at Boots. Hey ladies, happy Sunday! What have you got planned today? I’ve scheduled this post because I am actually down in London for the VE day 70 years on concert at the Royal Albert Hall. I’m so excited and I can’t wait to dress up! Sundays for me are generally lazy, though I might well be preparing for a new week ahead with a manicure. 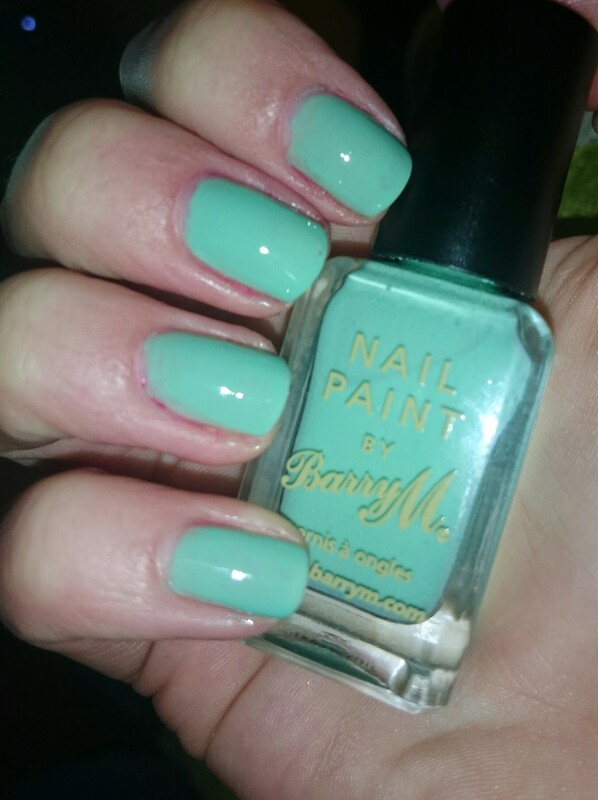 This weekend I swatched one of my new polishes (need for speed) from my latest Barry M haul. This one comes from the speedy dry collection and I honestly can’t endorse it enough. It works, and it’s great value from money. I’ll never stray from this brand. Ever. It might replace the matte collection in terms of best application… Might.. I bought these 4 together as they were bright and summery. I thought I might also share with you some pictures of the rest of collection. Particular favourites are the lime and the red Polish. Do you have a collection like this? It can’t just be me!! Just to share my weekend haul from my local Tesco. It’s is one of the larger superstores and has a very well stocked beauty section. 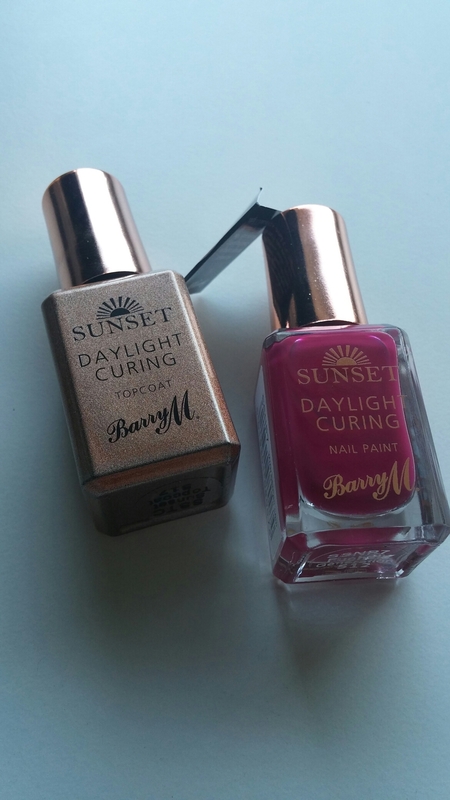 I was actually wanting to pick up the daylight curing nail polishes from Barry M but they’ve not quite hit that store yet! 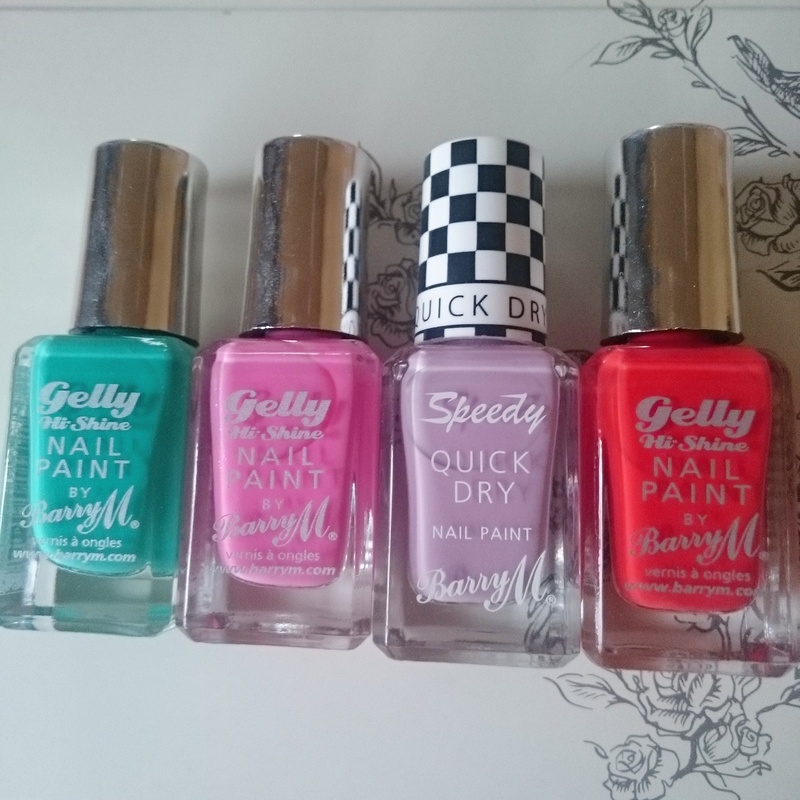 Instead I picked up 4 beautiful shades, 3 from the gellyshine collection and 1 from the speedy dry collection. From left to right we have Kiwi, dragonfruit, lap of honour, and satsuma, a fantastic orange shade I just couldn’t resist!!! I’ve swatched dragonfruit, a cute candy pink that doesn’t appear too pale against my skin which is prone to redden. 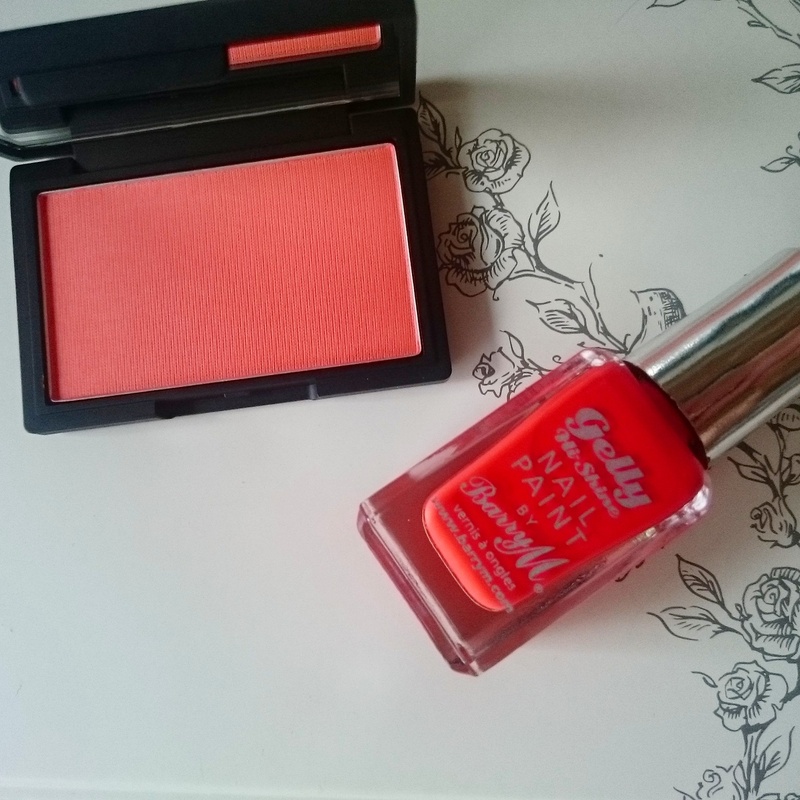 I also picked up a bright orange Blush that caught my eye immediately (shade is called apricot) from Sleek makeup, having seen it out on display. I only picked up a single, but they were available in a pallette with 3 shades, 4 different collections which now having used the Blush I would definitely be tempted to try out. life goal- do a cat eye without wearing it all over the rest of my ace : Achieved! Here I am wearing it on the apples of my cheeks – its soft and buildable. I also really like the packaging, it reminds me of NARS. 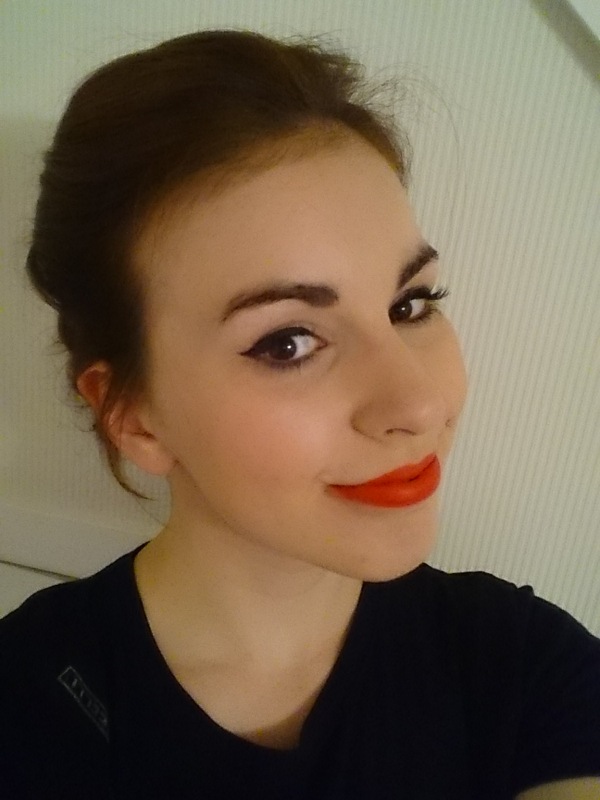 Hope you had a lovely weekend – I did a cat eye red lip look to go to the cinema to see The Avengers: Age of Ultron. Had to look my best in case Thor showed up!! Have you tried sleek makeup? I have been revisiting some old photos from my blog and marvelled at some of the amazing things I’ve used. Below is a gallery of some of my favourite products from this year. UPDATE: this polish chips easily! SAD FACE! Good evening! 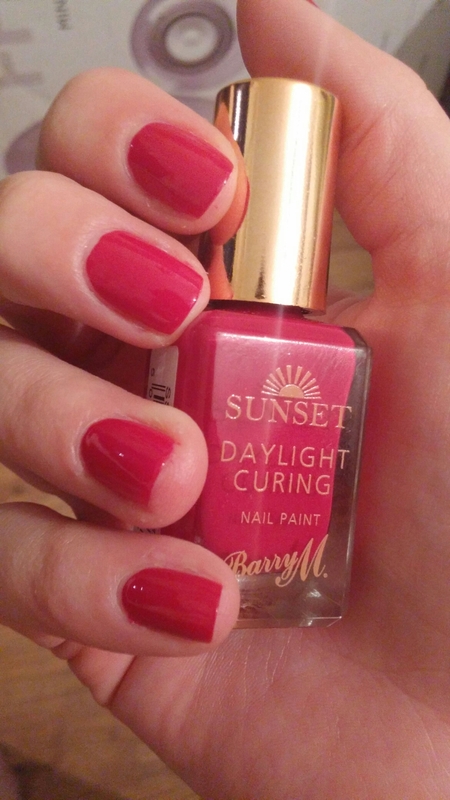 Sorry to be blogging so late but as it was Monday and I was doing a manicure I thought, hey! It’s manicure Monday! I paint my nails A LOT. I own a lot of polishes and the vast majority of them are BarryM. 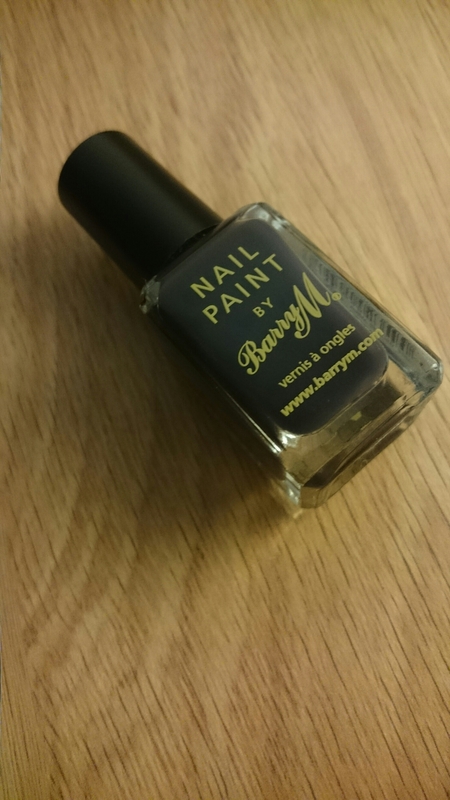 I blogged earlier today about my beauty buys from Superdrug – among them was this BarryM polish in a shade I’d never seen before, ‘Nightshade’. In the bottle the shade appears to have a purple tinge so I was excited to try it. The bottle lid is matte as well which lead me to believe it was z matte finish polish. It isn’t. In reality though it’s really just a black polish, although it applied really well. 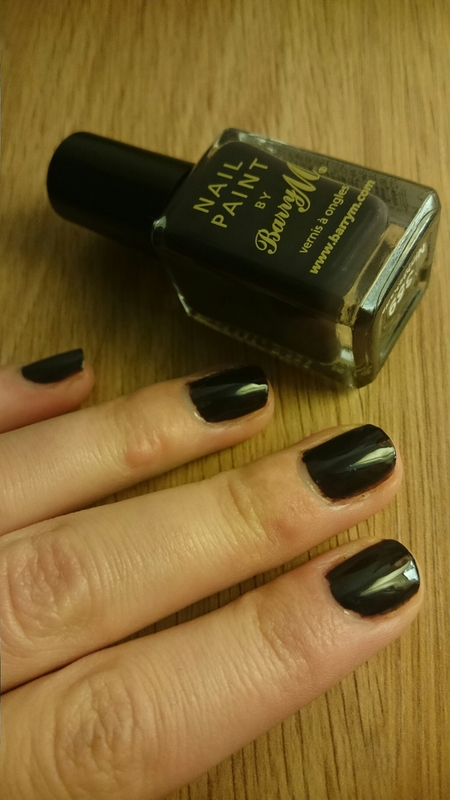 I normally have such a headache with black polish but this one was no trouble really. I’m wearing two coats with a top coat from 17 @ Boots. Have you got a shade that better fits the description ‘Nightshade’? 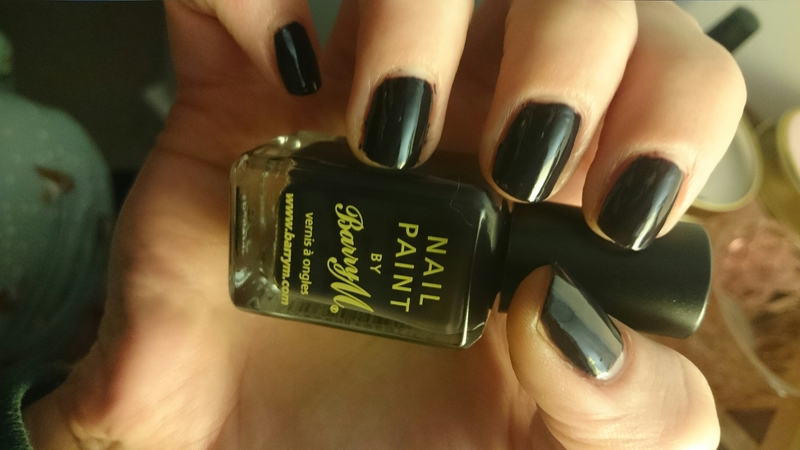 I blogged earlier this week about my Boots purchases, when I bought this BarryM original “black top” edition nail polish. I say original because they have released so many awesome collections recently their “black top” collection hasn’t been on my radar. Still, as a basic shades go they have an amazing range of colours and I doubt my collection will be anywhere near complete anytime soon! The shade I am switching is simple called ‘mint green’. At first I was not convinced it would cover enough in two coats, but I was proven wrong ! Amazing colour, and really impressed with the finish. Pictured wearing two coats and a top coat.